I bet you didn’t see this one coming right? Don’t be mistaken though, Dundee is going from strength to strength and now Lonely Planet has named Dundee as one of their Best in Europe for 2018. And it’s not just Lonely Planet who point point out Dundee as the Go To City for 2018. Prestigious publications like The Wall Street Journal, CNN, Bloomberg and the Guardian all citing the city in their 2018 travel itineraries. Famed for its continual reinvention, particularly after the decline of traditional industries such as whaling, shipbuilding and jute manufacturing, the city has transformed into a capital of cool – home to some of the country’s most exciting examples of design, innovation and culture. Sample some of the city’s tasty delights thanks to a diverse range of trendy bars, boutique restaurants and unusual eateries. Draffens is a unique speak easy bar, renowned for its inventive cocktails, tucked away in a hidden location within the city centre. Or raise a glass to Verdant Spirits, the first distillery in Dundee for 200 years and Scottish Gin of the Year in 2017. Inspired by the growing popularity of ‘Mother’s Ruin’, plans are now underway to open a gin school and visitor centre. Of course, no trip to Dundee is complete without trying an authentic Dundee pie or ‘peh’ at a local butchers such as Scott Brothers or why not have a slice of the iconic Dundee cake? This bakery favourite is still lovingly created at bakers like Clarks’ Bakery or Goodfellow & Stevens. With so much to see you’ll be spoiled for choice so how about sightseeing with a difference? Dark Dundee offers entertaining and informative walking tours around the city, partnering with venues such as Verdant Works, HM Frigate Unicorn, and The Howff, a 16th century graveyard in the city centre, to tell spine-chilling tales of the city’s sometimes gruesome past. If you prefer sightseeing on the go try Run the Sights, which combines a run with a guided exploration of some of the city’s most interesting and beautiful locations. Finally, see the city from the glorious River Tay with Pirate Boats, an exhilarating one-hour boat trip packed with anecdotes and local lore to bring the scenery to life. 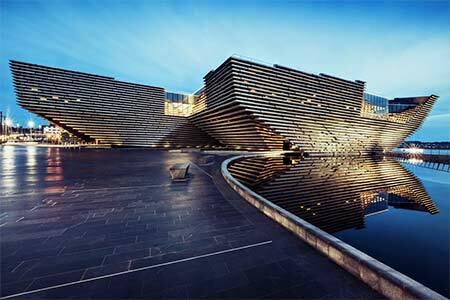 Dundee is chock-full of exciting experiences but here are some new additions to the city’s travel offering. OpenClose is an exciting street art project, showcasing the best in local talent. The city-centre art trail aims to brighten up unexplored nooks and crannies with 18 individually painted doors by 18 local artists. This year, OpenClose has extended into the Stobswell area of the city with 20 more new street-art locations to explore. For thrill-seekers a visit to the new 5-star Foxlake is a must. Dundee’s new wakeboarding centre at City Quay has premises opposite the APEX Hotel and within sight of the HM Unicorn.. Finally, Slessor Gardens, Dundee’s new public space, has been warmly embraced by the citizens and now with the advent of massive outdoor gigs, visitors can experience the waterfront for themselves. The inaugural concerts happened in 2017 and this year Steps, Rita Ora, Simple Minds, The Pretenders, and KT Tunstall will be hitting the right notes with music fans in the city. Dundee was in competition with 50 other global cities to join the City of Design network in 2014. It was named the UK’s first City of Design by the United Nations for the diverse design innovations. Dundee’s contributions to the world, include aspirin, biomedical research which has led to hundreds of new cancer drugs, comics including the Beano and Dandy, orange marmalade, and video games including Lemmings and Grand Theft Auto. Today the city’s vibrant population of young people continues to create and contribute to the city’s design reputation, including fashion and lifestyle designers Hayley Scanlan, Isolated Heroes, Abandon Ship Apparel and globally recognised luggage designers Lat56. Dundee’s young people are currently co-designing the opening event for V&A Dundee in September and the city’s first ever Dundee Design Parade is set to take place on Saturday 26 May as part of Scotland’s Year of Young People celebrations. Dundee is the birthplace of the Beano – Britain’s longest running children’s comic published by DC Thomson. Every week, children and adults across the world can follow the antics of legendary characters like Dennis the Menace.. Read an issue of The Beano Comic on the newly named Bash Street or check out the city’s best-loved comic characters, like Desperate Dan and Minnie the Minx in statue form. This year from June to October, to celebrate the Beano’s 80th birthday, the McManus will become The McMenace as The Bash Street Kids take over the museum. From legendary ships to the stunning shorelines of Broughty Ferry, Dundee is perfect for an accessible adventure. Handily Access Review website Euan’s Guide has created an informative guide to the city, packed full of highlights and advice to help visitors with access needs get the most from their trip. From wheelchair access on the Gun Deck of the only wooden warship in Scotland, HMS Unicorn to the induction loop system that film lovers can enjoy in the cinemas at Dundee Contemporary Arts. For more info on Dundee go to www.dundee.com.